Turkey and Israel are the closest they have been to a normalization of relations since the Marmara incident, says Ahmet Davutoglu. Turkish Foreign Minister Ahmet Davutoglu said Sunday that his country and Israel are the closest they have been to a normalization of bilateral relations since the Mavi Marmara incident, the Turkish Hurriyet reports. “There has recently been a momentum and new approach in compensation talks. We could say that most of the differences have been removed recently in these discussions,” the report quoted Davutoglu as having said in a televised interview. Stressing that there are “positive developments” in compensation talks and that “serious progress has been achieved,” he refrained from giving an exact time for a finalization of the process. 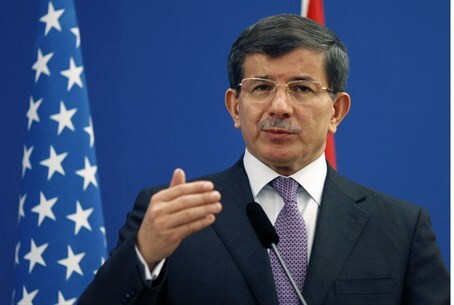 Davutoglu did not announce the amount of compensation being discussed for the victims of the Mavi Marmara incident in 2010, but did say that the difference had narrowed between what Turkey demanded and Israel offered. “These issues will be discussed with the families [of the Mavi Marmara victims] after the outcome [of the compensation talks] is clarified,” he said, according to the Hurriyet. Turkey-Israel relations became strained in 2010, when Israeli commandos staged a raid on a six-ship flotilla seeking to violate Israel's naval blockade of Gaza. One of the ships in the flotilla, the Mavi Marmara, refused Israeli orders to dock at the Ashdod Port. The commandos then boarded it, encountering violence from the members of the IHH organization who were on board and who attacked them with clubs and knives. The soldiers had no choice but to open fire, killing nine who were on board. When Israel refused Turkey’s demands to apologize for raiding the Marmara, Turkey withdrew its ambassador from Israel and expelled the Israeli ambassador in Ankara. Under pressure from U.S. President Barack Obama, Prime Minister Binyamin Netanyahu apologized last March to Turkish Prime Minister Recep Tayyip Erdogan for the deaths of nine Turks in the 2010 flotilla. Netanyahu, in addition to the apology, agreed to compensate the families of the nine Turks, while Erdogan promised to cancel the legal proceedings his country launched against IDF officials. Israeli and Turkish officials had been talking for months regarding compensation for the Marmara incident, and last week it was reported that Israel had offered to pay $20 million to the families of Turkish citizens killed during the raid. In addition to an apology and compensation for the victims, Ankara has also demanded that Israel ease the blockade on Gaza as a pre-condition for the normalization of ties. On Sunday, Davutoglu cited an easing of the embargo and claimed that compensation talks and subsequent steps would be important to this end. In the months that have passed since the Israeli apology, Erdogan has never let up on his verbal attacks of Israel. In one incident, he accused the Jewish state of being behind the military-backed ouster of Egypt’s Islamist president Mohammed Morsi. Nevertheless, Environmental Protection Minister Amir Peretz visited Turkey last December, becoming the first Israeli minister to do so since the Marmara incident. At the time, a Turkish official told Israel’s Channel 2 News that he welcomed Peretz’s visit, saying it was indicative of the fact that the sides were getting closer.